If you’ve been struggling to lose weight, why not consider something other than going to the gym more often? Did you know that a kitchen appliance can actually help you lose weight? 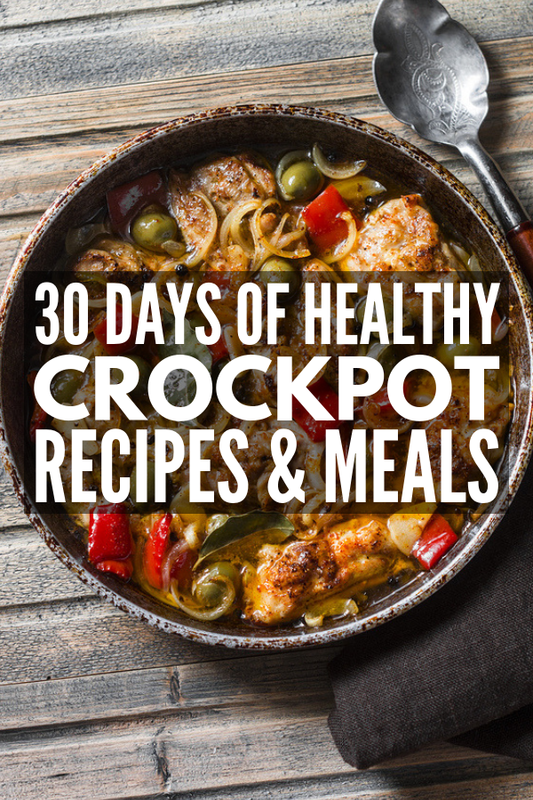 That’s right – we’re talking all things crock pot in this post, along with 30 crock pot recipes for weight loss! These skinny crock pot recipes are easy, peasy to whip up and they’re so delicious you won’t be able to tell they’re low calorie recipes! What is a Crock Pot? A crock pot is an electric kitchen appliance that cooks food at a lower temperature over a longer period of time. It’s used to cook dishes like stews, casseroles, and pot roasts slowly, so you can go to work and come home to a home-cooked meal. Crock pots feature a lid, pot and heating elements all along the side and bottom, with the heat surrounding the food and bringing it up to a high temperature safely. How Can Cooking With a Crock Pot Help Me Lose Weight? Weight loss can be a tricky thing, and many people think the key to losing weight is going to the gym every day and eating less food. Sure, in an ideal world that might work, but most people have crazy busy schedules that don’t always allow them to get to the gym. And the thought of taking the time to prepare and cook a healthy meal just isn’t in the cards. Pssst. Are you lazy about weight loss like me? That’s where the crock pot comes in. This handy appliance does all the work for you, allowing you to make incredible food with almost no effort or cooking experience. All you have to do is throw a bunch of healthy ingredients into the crock pot, let it cook while you go about your day, and come home to healthy and delicious meals that will help you lose weight! Weight loss crock pot meals are one of the most efficient ways to trim down your waist line! Are Crock Pots and Slow Cookers the Same Thing? Not exactly. Crock pots and slow cookers aren’t quite the same thing, although they’re often used interchangeably. They’re very similar, but you can think of it like this: A crock pot is a type of slow cooker. All crock pots are slow cookers, but not all slow cookers are crock pots. They both use moist heat to cook food over a lengthy period of time, and are used to cook the same types of foods, but they’re not exactly the same. 1. Heat Settings: Crock pots have two heat settings (Low and High) with some of them having a “warming” option. Slow cookers, on the other hand, often have a range of five heat settings. 2. How They Cook: Crock pots cook continuously while slow cookers can work in cycles, powering on and off during cooking. Some crock pots and slow cookers have the option to cook for a specific amount of time. 3. Position of the Pot: All crock pots feature a ceramic or porcelain pot that sits inside the heating unit, so they’re heated from the bottom and all around the pot. Some slow cookers also have the pot sit inside the heating unit, but others feature a pot that sits on top of a heating unit. These types of slow cookers make it more likely that the food on the bottom will scorch, and it will also cook more slowly this way. Crock pots come in round and oval shapes. The shape of your crock pot won’t affect the way it cooks, so it’s really up to you, your cooking needs and what fits best in your kitchen. Your cooking needs are the most important out of the three, so think about what you’ll be cooking with your crock pot and let that lead your decision. If you’ll be cooking things like a whole chicken or ribs, you’ll want to go with the oval shape, but meals like stews and soups can be made in either. Go for glass when it comes to the lid material of your crock pot. Plastic lids or lids that are more opaque make it more difficult to see how your food is cooking. Since you want to avoid opening the lid because it lets heat out, being able to see what’s going on inside is key. The size you choose for your crock pot will depend on your household needs. They come in a range of sizes, however most recipes are meant for the average size crock pot, which is six quarts. If you’re going to be making smaller meals and don’t want leftovers, you can opt for a smaller one. If you’re going to be cooking for a larger group on a regular basis, go bigger! If there’s one function you want in a crockpot, it’s a built-in timer! This allows you to set a cook time for your meal so it turns off at just the right time. Otherwise, you always have to be home to turn it off. The warming function is key to a good crock pot! All crock pots have high and low temperature cooking settings, but only some have the warming function. This keeps your food warm at a lower temperature once it’s done cooking, so it will be warm and ready when you are! Try these low calorie crock pot recipes to get your weight loss back on track! It’s the easiest way to weight loss that lasts! If you loved this post on crock pot recipes for weight loss, please share this pin on Pinterest! And if you want more weight loss recipes, make sure to follow our Health Board on Pinterest!